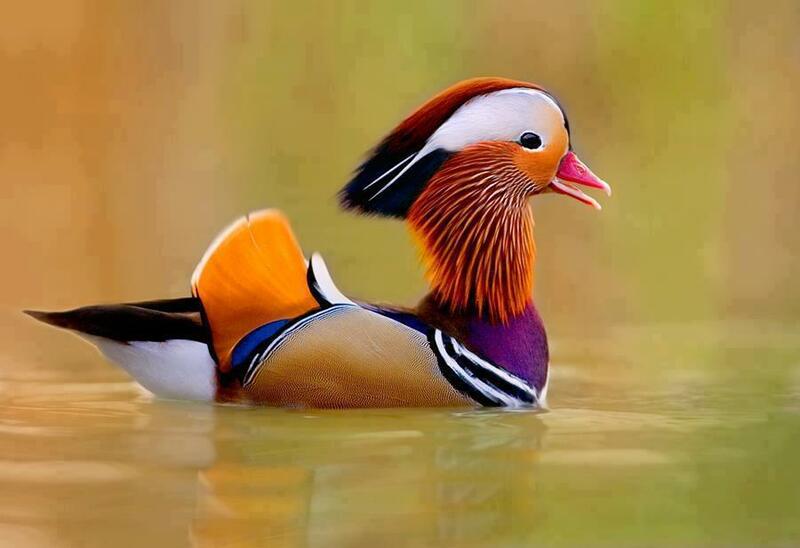 Mandarins feed by dabbling or walking on land. 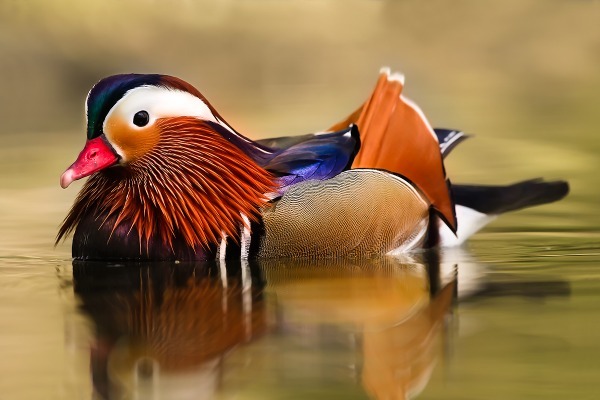 The mandarin duck (Aix galericulata) is a perching duck species found in East Asia. It is medium-sized, at 41–49 cm (16–19 in) long with a 65–75 cm (26–30 in) wingspan. 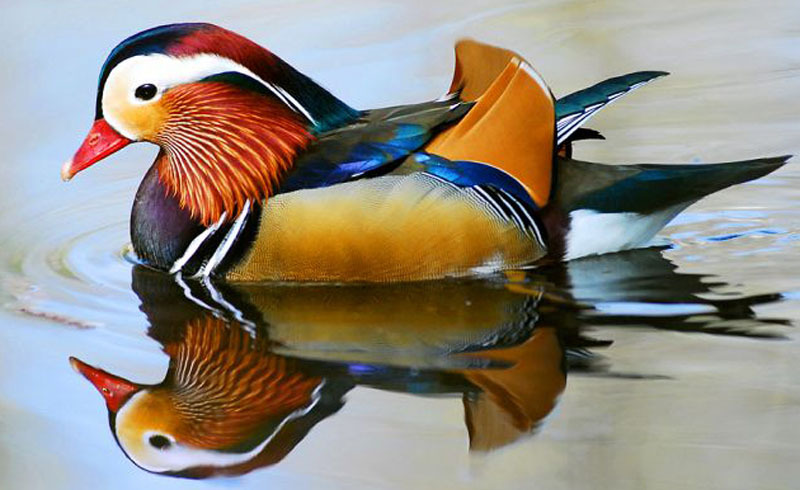 It is closely related to the North American wood duck, the only other member of the genus Aix. Aix is an Ancient Greek word which was used by Aristotle to refer to an unknown diving bird, and galericulata is the Latin for a wig, derived from galerum, a cap or bonnet. The adult male has a red bill, large white crescent above the eye and reddish face and "whiskers". The male's breast is purple with two vertical white bars, and the flanks ruddy, and he has two orange "sails" at the back (large feathers that stick up like boat sails). The female is similar to the female wood duck, with a white eye-ring and stripe running back from the eye, but is paler below, has a small white flank stripe, and a pale tip to its bill. Both the males and females have crests, but the purple crest is more pronounced on the male. 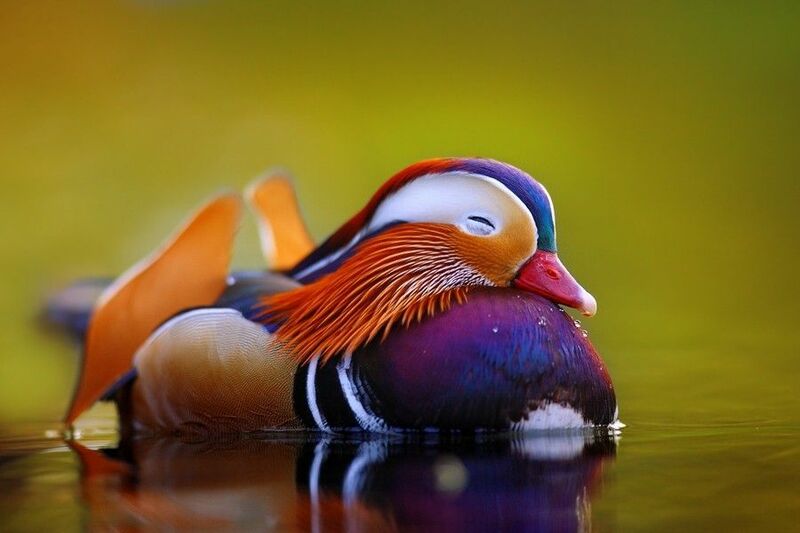 Like many other species of ducks, the male undergoes a moult after the mating season into eclipse plumage. When in eclipse plumage, the male looks similar to the female, but can be told apart by its bright yellow-orange or red beak, lack of any crest, and a less-pronounced eye-stripe.